← Day 8 July 2 – Mark the milestones! Those who have been following this blog know that yesterday was a tough day for me. The heat, lack of sleep, wear and tear on my body and likely also a shortage of calories the previous day had all gotten to me. Only the thought that my pain was nothing compared to that of Saikou’s father, who died a painful and unnecessary death due to an untreated stomach ulcer and the pain of many other people in the Gambia who do not have access to health care, kept me going. But what a difference a day can make! We had a big storm and lots of rain late the previous afternoon and this brought a welcome breeze and a slight drop in temperatures. As a result, I was able to sleep well and even slept through my alarm. I didn’t wake up until 6:45, more than an hour later than my usual time. I had clearly needed the rest, so I didn’t mind that it would mean running in the hotter part of the day. We got on the road quickly after I taped my feet and knee, and to give myself a boost, I broke out a brand new, never used pair of Mizuno Ronins. Following a 20 kilometer drive back on the road from Soma to where I left off the previous day, we began to run. 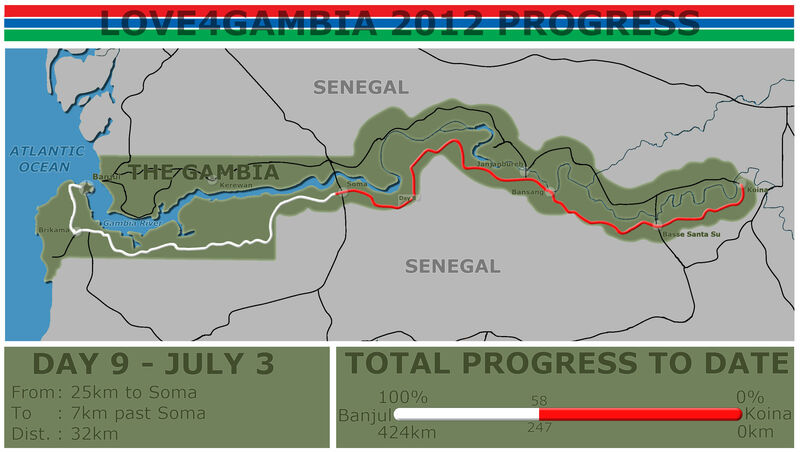 Team Love4Gambia 2012 is reaching star status! It was still somewhat cool, so the going was good. But before we got far down the road, we came upon a village where a group of men were sitting by the roadside. One of them asked me to where I was running and when we told him we were heading from Koina to Banjul, he wanted to know my reasons. He had never heard of anyone running from Koina to the coast and pulled out the latest and greatest iPhone model to record us and my response. “I am running for your children,” I told him and explained that my run was a fundraiser for children’s health education programs. By now, lots of kids had come out of the village to see what was happening and to meet the toubab. The usual fist bumps, high fives and smiles ensued, as did the photo taking and then showing the kids their pictures on the display of my digital camera. But as always, there was one child that ran away screaming in fear of the strange white person. I was feeling good and the first 10 kilometers went by quickly. I felt relieved and grateful that this morning would not be a repeat of yesterday. By the time we got to 15 kilometers, it was getting hot out. But I knew that we would come through Soma soon where we could buy some ice. I also looked forward to buying a cold Coke, which would be a nice treat. A mass taxi came by and the driver honked a greeting as he went past. When the van came to a stop at the police road block up ahead, I saw squeezed in the back, the man who had been video recording our conversation earlier. He gave me a broad smile and a thumbs up. Only 2 kilometers left to Soma now. Once we reached the busy town, which is at the cross road to Senegal, I received lots of shouts of encouragement. I stopped at a shop and bought a cold Coke. The sugar, caffeine and cold liquid gave me a big boost. I also purchased a banana from a woman carrying a tray full on her head. Thus strengthened, I ran through the rest of the town before turning left on the road to Banjul. Here the pavement ended and I was back on a bumpy dirt road. Parts of the road were quite muddy from yesterday’s rain and my white, new Mizunos were soon coated in the red mud of the South Bank Road. Over a week ago, when we drove from Banjul to the start point of the run in Koina, we had stopped at a camp to buy some water. Three toubabs were sitting in the shade of a metal roof with some locals, tunes cranked and rocking out to Bob Marley. I had gone over to meet them and learned that the toubabs were from Ireland, South Africa and Germany and were working on a road project. They had not yet completed the work to Soma and from where I finished my run today, I will have approximately another 50 kilometers of dirt road ahead before I reach asphalt again. The guys were impressed by our Love4Gambia venture and made a donation in the amount of 500 Dallasis (the local currency) on the spot. But before getting back to the place I met them, there are still two more days of running. Thank god for the shade of the baobab tree! Since it was pretty hot by now and the heat was radiating off the road, I stopped under a baobab tree to enjoy its shade for a moment. A boy came over with an open baobab fruit in his hand and gave me some to try. Soon other children followed and I handed out some stickers. The kids were so well behaved – there was no shoving or grabbing, but they all patiently waited their turn and then repaid me with big smiles. Our next stop would be the finish of today’s run! When we reached 20.46 miles, there was a nice big tree on the side of the road. We set up our temporary rest camp under its canopy and called it a day. 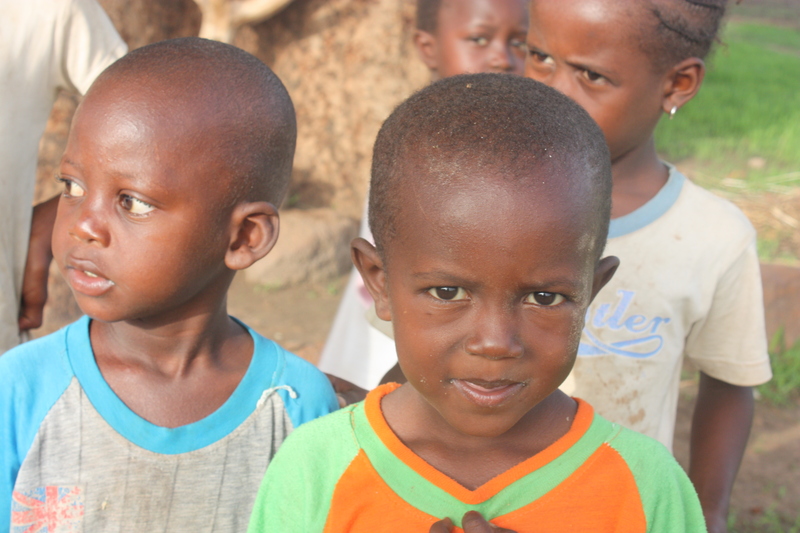 The beautiful children of the Gambia. Help them by clicking the “Donate Now” button. Across from us in a field some women were working. They waved at us and we headed into the field to say hello. It turns out, this same spot had been a rest spot for Erin when she ran across the Gambia last year and the women remembered seeing the team. Following the introductions, the guys and I took the hoes from the women and worked the field for a little, bit by bit loosening up the tough ground for planting rice. The woman sang and chanted while we worked. They even composed a song for me and sang out my name as part of the lyrics. There was also dancing in the middle of this field and spirits were high even though they were out doing back breaking work in the hot sun. Some of the women had children in the schools that are benefitting from the health education programs of the Nova Scotia Gambia Association, so the women expressed their thanks for what the team was doing. It was a touching and heart-warming meeting. We then drove back to Soma where we will spend another night before moving on tomorrow. We had lunch in town and rested in the afternoon. Next, a group of teenage kids came over to take part in a drama class Pa Modou had offered to teach. Theatre is storytelling and a significant part of the culture. It is also an excellent way to communicate the important health messages the NSGA wants to share with youth in the Gambia. It was fun to watch these teens engaged and performing their skits. Even though I didn’t understand a word, as the plays were performed in the local language, it was obvious that a good time was had by all. While I was watching the children, an SUV with a Gambian flag attached on the front drove into the courtyard. The person inside was the Governor of the Lower River Region, the official representative of the President in these parts. He heard about what we were doing and had asked to be introduced to me. We had a pleasant conversation and he expressed his appreciation for the project as well as his promise to join part of the run next year. As I am sitting here writing and sweating, the clouds are rolling in again and the wind is picking up. Looks like we will get more rain and with that hopefully another good night’s sleep. Thanks again for all the great and encouraging comments, as well as for the many shares of this blog on Facebook. It is hard to put in words how much your support means to me! Please encourage your friends to donate to Love4Gambia through our website to help us make a difference in the lives of children here in the Gambia! This entry was posted in Charity Run and tagged Africa, children's health, Gambia, Mizuno, The Gambia. Bookmark the permalink. 8 Responses to Day 9 July 3 – What a difference a day can make! wonderful…this one made me tearful. I also love that you told the father that you were running for his children. You are sleeping now. I hope that you have a cool breeze at your back tomorrow….sending you closer to the coast!! Banjul calling!! I can picture the women dancing in the fields, celebrating with you and your team, and remembering Erin! I love how the word spreads from village to village and everyone from very young children to governors come to cheer you on with all sorts of reactions – interviews, smiles, songs, dances and surprised children. What a feeling that must be. You are all connected, like the spider web that Erin described last year, absolutely beautiful. Your energy is infectious – I hope you have lots tomorrow after a good night sleep. Hi Andrea! My name is Oliver Woods and I am a new board member to the NSGA.I just wanted to send my love and support to the team! You guys are doing amazing! You are truly inspirational and you can be sure the board and much of Nova Scotia is cheering you along every step in our hearts! I had a hard enough time driving across the country (alongside your fellow team member Kebba) let alone running it! Keep up the good work and send our love to the rest of the team!! Wonderful to hear that you are doing so well Andrea. The run is an amazing challenge but the cause so worthwhile. I love your stories of the people you meet along the way and the support you receive from all walks of life. Hugs from all the NSGA community in Halifax–we were updated at the Board meeting last night and I was pleased to get more details through the blog! I totally agree with Cathy, this one made me a bit tearful as well. What an amazing adventure you are having, and for such a wonderful cause! We are behind you every step of the way! Wishing you a cool breeze! Andrea, you continue to inspire, make most of us jealous we can’t be there with you to experience this life changing adventure you are on! Keep up the positive attitude and we will do a rain dance for you back home! It is over 30 celcius here and humid but nothing compared to what you are RUNNING in daily. Even your Mizuno gear can’t keep you cool in those temperatures! Much love sent your way from Canada!